Woes continue to rock the 2017 Malawi School Certificate of Education (MSCE) examinations which are currently underway with the latest being the news that teachers assigned to invigilator the said exams will use personal money. This has been disclosed in a letter signed by Malawi National Examination Board (MANEB) Acting Executive Director Jack Chalimba addressed to District Education Managers across the country. 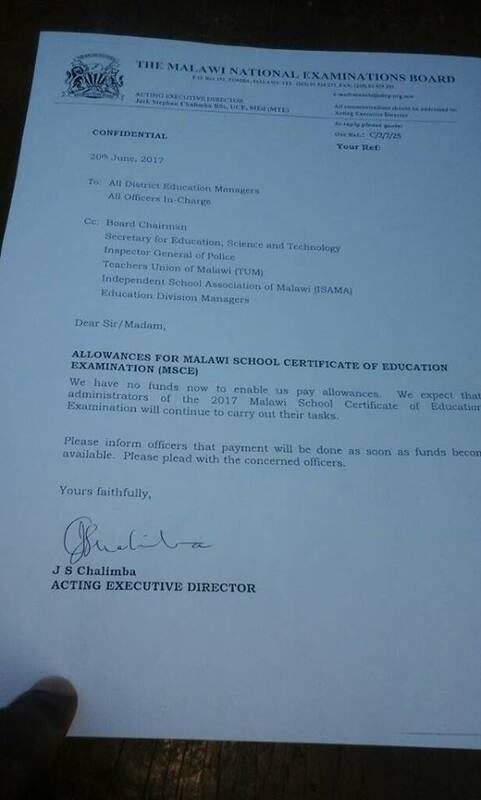 In the letter, Chalimba has told all Education Managers, Teachers Union of Malawi, Inspector General of Police that the board has no funds to be used as allowances during MSCE exams. “Please inform officers that payments will be done as soon as funds become available. Please plead with the concerned officers,” reads in part the letter. Meanwhile reports indicate that MSCE exams have been leaked.